The major city in California is set to become the largest city in the United States to run on 100 percent renewable energy according to a recent speech of the mayor Kevin Faulconer. It is seen as a job motor and a key driver for the reduction of the city’s greenhouse gas emissions. Solar energy is a key element and will help to achieve this ambitious target. Already the former governor Arnold Schwarzenegger announced the 2050 greenhouse gas (GHG) reduction target of 80 percent compared to the year 1990 for the entire state of California. 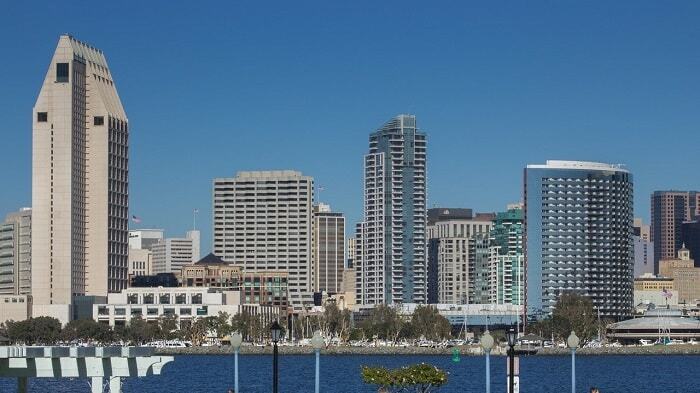 According to the 74-page Climate Action Plan of San Diego, concordantly approved in December 2015, the city is a leader in innovation and sustainability and takes the lead in California to tackle climate change. Several facts justify this claim. According to the state environmental group Environment California, solar installations have grown 76.6 percent in two years in San Diego. It is the city with the second-highest number of solar panels in the United States, just behind Los Angeles. According to Nicole Capretz, executive director of the Climate Action Campaign, rooftop solar will contribute about 20 percent of the ‘100 percent renewable energy goal’. Researchers claim that San Diego had enough solar capacity at the end of 2015 to power about 47,000 homes. Ranking 4th behind Honolulu, Indianapolis and San Jose, San Diego also scored well on a solar-per-person basis. Generally, renewable energies play a decisive role to achieve the GHG reduction targets. A combination of on-site generation and large-scale renewables is planned to assist the City in meeting its ambitious targets in an efficient way. San Diego’s fortunate geographical position and many hours of sun are customized conditions for solar power systems. A crucial advantage for the switch to 100 percent renewable energies. The City also has photovoltaics systems installed at various facilities. Approximately 2.2 MW of renewable energy is provided by photovoltaic plants at water treatment plants. The new 3.3 MW solar panel system in front of San Diego’s International Airport is expected to save up to $8 million in energy costs over the next 20 years. Approximately 55 percent of community-wide emissions in 2010 are contributed by the transportation system. For this reason, transportation strategies cover a broad range of activities with the objective to reduce vehicle miles traveled, improve mobility, and enhance the fuel efficiency of vehicles. Individual transposition measures involve, for example, changing land uses, promoting alternative travel modes, revising parking standards, and managing parking. San Diego intends to make about 50 percent of its vehicles electric. The decomposition by-product of organic material – methane – has a warming impact which is twenty times higher than carbon dioxide. Because of this, San Diego aims to achieve a 75 percent waste diversion rate by 2020. The City also strives for the Zero Waste disposal by 2040. It is already possible to generate nearly 15 MW renewable energy with methane from landfills. Furthermore, the Point Loma Wastewater Treatment Plant is able to produce green gas and inject it into the natural gas pipeline. Additionally, it is planned to increase the city’s tree canopy cover to 35 percent. The advantages are clear: A reduced Urban Heat Island effect, the enhanced ability to absorb carbon dioxides, providing cool and shaded places, and a greener city scape are significant benefits in the hot city adjacent to the border with Mexico.